Director of collection: Perez Pedro J. Advances in Organometallic Chemistry contains authoritative review articles of world-wide known researchers on the field of organometallic chemistry, covering topics in organometallic synthesis, reactions, mechanisms, homogeneous catalysis, and more. 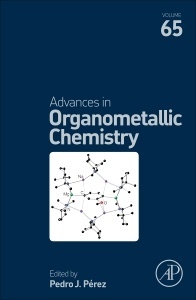 The book will benefit a wide range of researchers involved in organometallic chemistry, including synthetic protocols, mechanistic studies, and practical applications.